Quinnipiac women’s lacrosse (3-9, 2-2 MAAC) comes back home after a three-game road trip that lasted 11 days to play the hot Fairfield Stags (7-4, 3-0 MAAC). The Bobcats went 2-1 defeating both Iona 14-13 in overtime and Manhattan 12-11 while falling most recently to Marist 10-4. The Fairfield Stags enjoy a perfect 7-0 all-time record against the Bobcats. The last meeting between the Stags and Bobcats was a lopsided 17-3 loss in the 2016 season. All three Quinnipiac victories came in comeback fashion by three or more goals against CCSU, Manhattan and Iona this season. Junior goaltender Kyle Larkin set a career record as she registered 20 saves on 30 shots on goal in Quinnipiac’s last game against Marist. 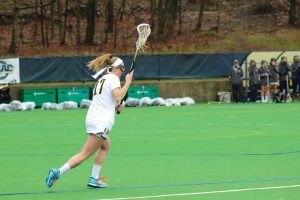 A Bobcat victory would help Quinnipiac in the MAAC standings as women’s lacrosse heads into the final two weeks of the regular season. Senior midfielder Alex Hlesciak has tallied a team-high 22 goals this season while sophomore attacker Allison Kuhn leads the squad in points with 25. The Stags are entering this contest on the winning side of five consecutive games. Fairfield has also won seven out of their last eight games. Not only do they look to extend their winning streak to six games, but their all-time winning streak against Quinnipiac to eight games as well. This season the Stags have outscored all their MAAC opponents including Siena, Niagara and Monmouth by a total of 48-20. Fairfield stands alone in first place in terms of forced turnovers per game at 10.82, shots taken per game at 29.2 and goals against average at 8.80. These numbers demonstrate consistency not only on the offensive side of the game, but defensively too. Fairfield is currently 3-0 in MAAC play as they aim to improve to 4-0 against the Bobcats. The Stags remain in high contention with the Canisius Golden Griffins for the MAAC regular season championship. Senior attacker Riley Hellstein comes into this game with an impressive 50 points, 38 of which are goals and 12 of which are assists. She ranks second in the conference as far as goals scored per game with 3.45 and points per game with 4.73. Various Stag players are responsible for the goal scoring this season. Junior Brenna Connolly has 13 goals, midfielder Alex Fehmel has registered 20 goals and senior Scarlett Sulliman has tallied 16 goals thus far. Senior goaltender Caleigh O’Connor owns the top spot for MAAC goals against average at 9.10 in addition to he fifth position in save percentage at .470.